Temple Baptist School / Admissions / What Is The Gospel? The gospel is the essential message of Christianity. It is the good news that Jesus Christ came to earth, lived a sinless life, and died on the cross to redeem mankind from sin. Through His resurrection from the grave, the power of death was defeated. By trusting in Christ, as our atoning sacrifice, we may have eternal life. 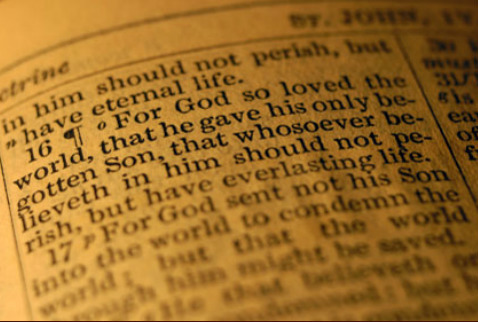 The gospel is neatly summarized in John 3:16. "For God so loved the world that He gave his only begotton Son, that whosoever believeth in Him should not perish, but have everlasting life." To be honest, that is an offensive message today. Why? Well, the good news of the gospel takes into account that man is depraved. The Bible says 'the heart is desperately wicked, who can know it?' We are born sinners and although we may think we are good, our standard is not what counts. Normally, we think we are pretty good and we don't like hearing that we are depraved. That's not music to our ears. In our self-absorbed, self-esteem driven world, it's not politically correct to tell people that they are sinners, that they are lost without Christ, and bound for an eternity in a place called hell. However, that is exactly what Jesus tells us in the Bible. Truth is truth, no matter how unpopular is it. Just because it offends our sensibilities, it is still truth. Jesus also said, that the way to eternal life is through a very narrow road and few that be that find it, since the broad road leads to destruction. And a cursory glance at our world, will confirm that mankind is capable of heinous acts of evil. Children do not have to be taught to misbehave, to lie, to cheat or to steal. They will do it quite naturally; in fact, good parenting calls for correction and reproof so that children do not do these things. And given the level of violence in our world today, we can see that things are not getting better. The existence of sin in the world has created a chasm between man and a Holy God. Sin has brought ruin to the human race, thanks to Adam's sin. But the Second Adam, Jesus Christ, through His death on the cross and resurrection, made a way for us to escape God's condemnation. God gave man a choice, but his sin in the garden left him condemned. However, through faith in the atoning work of Christ, man has been redeemed. Christianity is not a crutch. It's not an easy way. It's not mumbling a formulaic prayer. Actually, it's a personal relationship with the God of the Universe, an impossible feat, made possible through the work of Christ, God's son. In a world of moral relativity and 'anything goes' philosophy the fact that God exists and holds man accountable to live righteously is an offense to our humanistic mindsets. We feel we ought to be able to set our own moral code. No one should be able to tell us how to live, right? We can be very sincere in our beliefs. We can be sincere... and wrong. Man does not set the rules. The gospel is good news to a world that needs Jesus Christ. The fact is that Christ said, there is no other way to eternal life. It's pretty exclusive. It's not good works, it's not organized religion, it's not deeds, baptism, or even joining a church. It's placing your faith in Christ, repenting of your sin, and asking His forgiveness. That decision to follow Christ does not mean everything will go your way, like some of the fatuous TV preachers suggest. It does mean, that your sins are forgiven, that you have eternal life, that you can have an internal sense of peace and joy and happiness thanks to a right relationship with God. And for the Christian it assumes a life of obedience to God's Word and a love for Christ. It's definitely life changing. Frankly, that's what we want for our students. That's the very reason for our existence. Obviously, we are a school. We exist to educate. But our worldview is based on the unshakable and morally consistent truths of God's Word. It is the grid by which we view all subjects. Ever wonder where you are going when you die? Doesn't something resonate within your soul that you know you will live forever? Don't you realize that deep down, there is an inner dissatisfaction that things, money and entertainment cannot fulfill? It's there all right and it's how God made us. He made us incomplete without him. Sin has marred our relationship with God. Christ has set us free from the slave-market of sin and given us a new standing with God. There is nothing greater than the gospel of Jesus Christ. Through Christ, we have direction, hope. joy, and peace -- in a world that ultimately offers none of these things, but emptiness. That's the good news of the gospel. Do you know the Lord Jesus Christ? Trust Christ as your Saviour today. And if we can help you understand the gospel of Jesus Christ, call us.